A crane collapsed across the span of New York’s Tappan Zee Bridge today, blocking traffic and wreaking havoc on the state’s longest bridge. 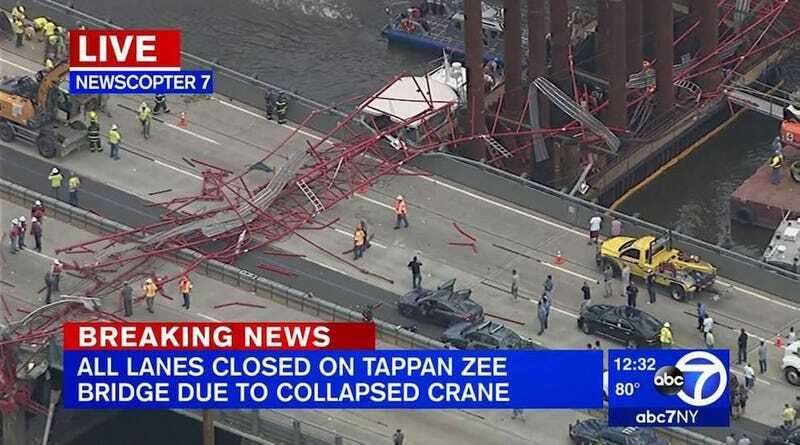 The crane collapsed just after noon near mile marker 15, NBC reported. Rockland County Executive Ed Day said three motorists and two bridge workers were injured, according to Lohud. The collapse brought traffic to a standstill. Authorities had said earlier today the bridge would be closed “indefinitely” until the crane was removed, though according to Governor Andrew Cuomo, some lanes on the bridge were set to re-open this evening. The reason for the collapse is still unclear. Some damage to the bridge has been reported; Ed Day told Lohud that there was a “punch through” hole on one side of the bridge, as well as a hole in the guard rail. The crane was being used to build a replacement bridge for the Tappan Zee Bridge, construction of which is slated for completion in 2018 and estimated to cost roughly $4 billion. The current Tappan Zee Bridge, which opened in 1955 and was only intended to last 50 years, is something of an infrastructure nightmare. According to a 2015 piece in the Atlantic, New York had to spend $300 million to fix the bridge’s deck “because five-foot-wide holes started opening up along the span.” Meanwhile, the ongoing construction to replace the bridge was delayed for more than three decades in bureaucratic red tape and hand wringing. This post has been updated to reflect new information about the number of injuries and lane re-openings.